Most kids don’t like eggplant, and I might be deemed weird, but growing-up, I loved most all vegetables with the exception of the “forbidden three”: brussels sprouts, bell peppers and bitter melon. My favorite was eggplant, or nasubi. Was I a weird kid? Maybe, maybe not. Mommy and Bebe E love yaki nasu! My Mom often made my favorite yaki nasu during the summer. 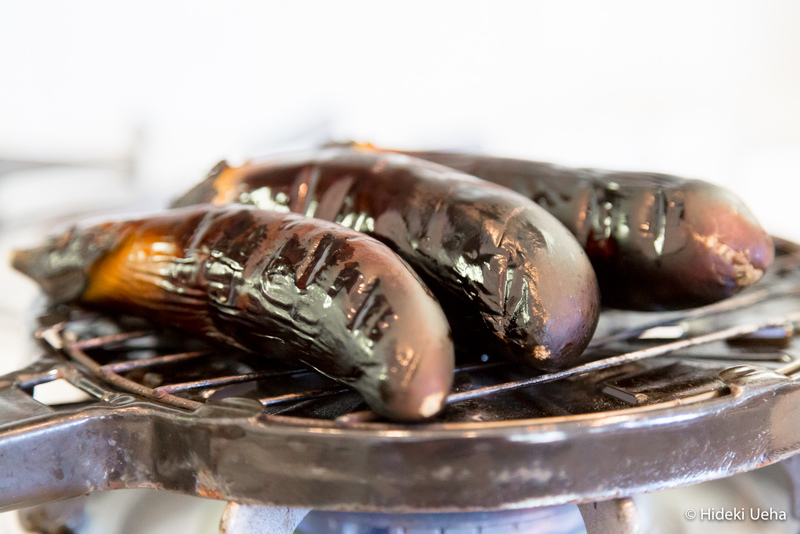 Actually, my Dad would throw the eggplants on the BBQ grill and my Mom would prepare it, but there’s something magical about eggplants grilled outdoors: they absorb that smokey BBQ flavor. It makes yaki nasu THAT much better. After my Mom peeled the skin off the grilled eggplant, she would make individual appetizer plates for each of us, and then she would chill the dish. On a hot day, a cold serving of smokey-flavored yaki nasu, simply garnished with soy sauce, bonito flakes and fresh ginger, was the absolute best. It brings back great memories. We often ate yaki nasu as a side dish to grilled fish or somen noodles. During the colder months, or when my Dad didn’t have the BBQ grill going, my Mom would simply grill the eggplants indoors on a little Japanese indoor grill, like the one you see below. 1. Spray grill with cooking oil. On an indoor grill pan, or outdoor grill, cook eggplant in their skin over medium high heat until the inner flesh is soft and tender and the outer skin is charred. About 6 – 7 minutes on each side. 2. Either place the eggplant (skin on) in cool water, or allow it to rest until room temperature. My Mom usually allows the eggplant to rest until room temperature. 3. 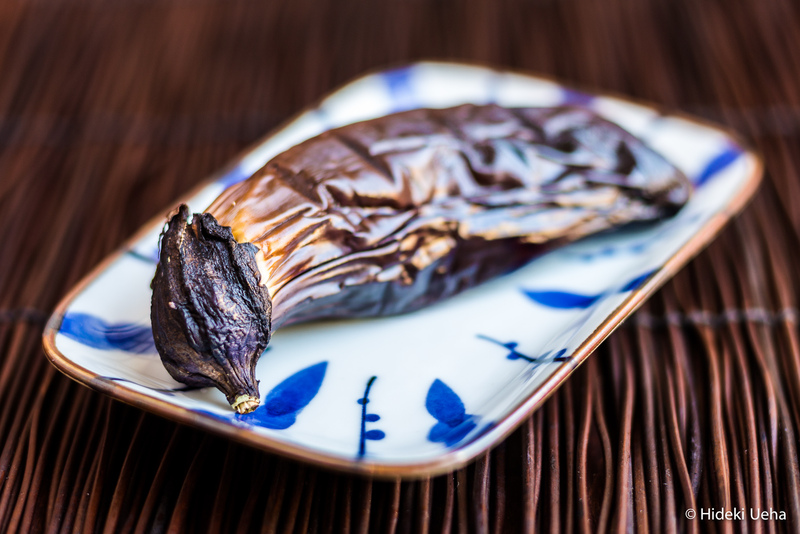 Once the eggplant cools, gently remove all of the charred skin of the eggplant. Remove the stem, and chop the eggplant into thirds or fourths, creating small bite size pieces. 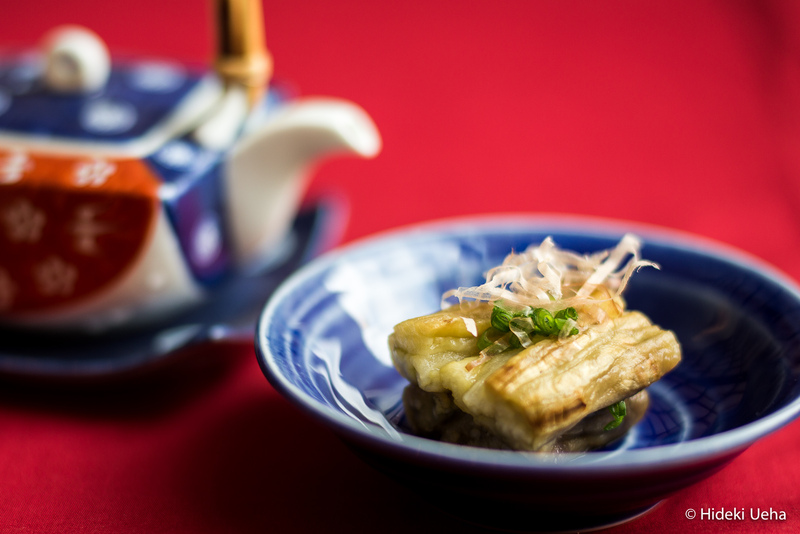 Note: yaki nasu can be served at room temperature or chilled. 4. Plate the yaki nasu and garnish with fresh grated ginger, bonito shavings and sliced green onions. Drizzle with soy sauce. 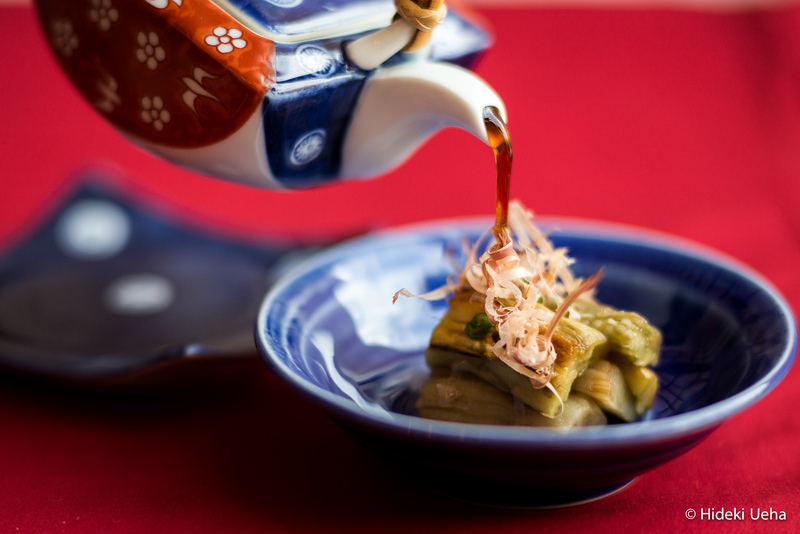 (Dashi shoyu or ponzu are alternative seasonings). While there are recipes for yaki nasu served with a dashi sauce (which can be made with home made dashi, soy sauce and mirin) we always ate ours simply served with soy sauce. Special thanks to my brother-in-law for the beautiful yaki nasu pictures that you see in today’s post! Please take a moment to visit Hideki Ueha to see his full portfolio on Flickr. Oh, and about them Lakers… If any of you watched Saturday night’s horrible Game 4 against Oklahoma… I am truly sorry! Thankfully, since I wasn’t feeling well, I fell asleep just before half-time and missed the entire 2nd half of the game, including what I heard was, an absolute nightmare 4th quarter. Yet, as a Lakers fan, I couldn’t help but wake-up at 2 AM, anxious and curious, reaching for my phone in the dark to find out what happened. 103 – 100, Oklahoma. What of tonight’s Game 5 Lakers vs Oklahoma to be played in Oklahoma? I’ll be watching, cheering and hoping the Lakers will play like a team, not blame each other like little school boys and instead put their best effort forward, win or lose, with heads held high. However, if I fall asleep again, it wouldn’t be the end of the world. This entry was posted in Appetizers, Bebe E's Favorites, Family Favorites, Japanese Cuisine Favorites, Lakers, Vegetables & Vegetarian and tagged appetizer, eggplant, grilled eggplant, Japanese eggplant, Japanese Food, yaki nasu by Judy | Bebe Love Okazu. Bookmark the permalink. Yuck!! Nasubi!! My absolute, least favorite vegetable!! Never got to liking this vegetable ever since I was a child. I think you were a weird kid, liking all them vegetables!! LOL But my lil one loves all vegetables, so guess it just depends on the child. Although, as my lil one has gotten older, she seems to have lost her likeness for nasubi. She wrinkles her nose now. LOL I hope it’s not my fault! Yea, the Lakers. Not exactly sure what happened, but I hope I they pull through tonight! GO LAKERS!!! Aloha! Oh, you are SOOOO missing out on one of life’s BEST vegetables! LOL! There’s nothing better than a squishy eggplant! LOL. Love it!!! I suspect the Lakers will lose tonight, ending their season, but I will cheer for them and hope they will play REALLY great. Beautiful photos also by your brother-in-law! Hi Melissa! Thank you! You know what also works is Chinese eggplant. They looked really similar to the Japanese eggplants and I’m not sure if they are one and the same. Thx for connecting with me on foodbuzz. I just subscribed to your blog feed and can’t wait to see what your next post will be! Thank you! I’m looking forward to sharing. You’ve got a great site and some great recipes!